Designed to kill lice before detection. Gentle for use in place of regular shampoo. Vamousse Lice Defense Daily Shampoo is available without a prescription and over the counter nationwide in retail pharmacies and online. Using Vamousse Lice Defense is as easy as washing your hair. Apply a generous amount of shampoo to wet hair, work into a lather and massage into the scalp. Leave the shampoo in hair for at least 3 minutes; rinse with warm water. Use for 10-14 days following exposure to lice and during treatment of a sibling. 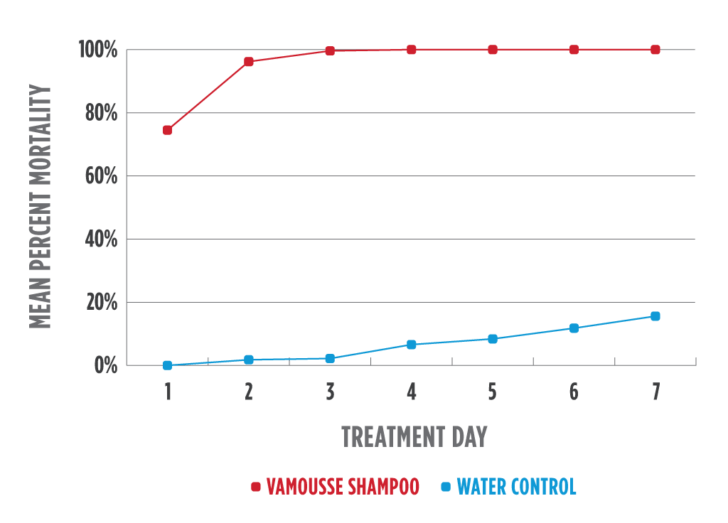 Vamousse Lice Defense was designed to eliminate ongoing worry after exposure to head lice. Always check for an infestation first, and use Vamousse Lice Treatment if lice or eggs are found. If you are still concerned that exposure may have occurred, you can take action now rather than waiting for an infestation to be detected. Vamousse Lice Defense is designed to be a swap in your child’s normal routine, without adding any bathing or grooming steps. This shampoo starts working on contact to kill lice, yet its gentle formula leaves hair soft and manageable, And because it’s pesticide-free, it has no pesticide-resistance issues. Vamousse Lice Defense is pesticide-free and kills lice using the active ingredients Natrum Muriaticum (sodium chloride) and Eucalyptus Globulus. Vamousse uses a physical mode of action to kill lice. The protective lipid layer of the adult lice is compromised by the advanced formulation to rapidly deliver the active ingredient to the louse, causing a rupture of the intestinal tract followed by dehydration. How much shampoo do I need to use? The instructions say a ‘generous amount’. Should this be more shampoo than I would typically use? The amount of shampoo you should use will vary depending on the length, texture and thickness of your hair. Use enough shampoo to allow you to completely lather your scalp and hair, working the shampoo thoroughly throughout the hair with attention to the areas behind the ears, at the nape of the neck, and completely from the root to the tip of the hair. How long should I leave the shampoo in my hair? Follow the instructions on the package for best results. Work the shampoo into a lather in wet hair and massage it into the scalp. Leave the shampoo in your hair for at least 3 minutes. Leaving it in longer is not a problem. Can I use my normal daily shampoo and/or conditioner after shampooing with Vamousse Daily Lice Shampoo? Yes, you can use your normal daily shampoo or conditioner after you have applied, lathered, waited for at least 3 minutes and then rinsed the Vamousse Daily Lice Shampoo out of your hair. Vamousse does contain a traditional shampoo to clean hair also, so an additional shampoo is not necessary. Can I continue use my normal hair styling products (sprays, gels, mousse, etc.) during the 10-14 day period of using Vamousse Lice Protection Shampoo? Yes, you can continue to use your normal hair styling products as desired after shampooing with Vamousse Daily Lice Shampoo. How long after using Vamousse Daily Lice Shampoo do I have to wait to go swimming? You can go swimming any time after washing the Vamousse Daily Lice Shampoo out of the hair following the instructions. Is Vamousse Daily Lice Shampoo safe to use on color treated hair? Vamousse Daily Lice Shampoo was not designed specifically for color-treated hair. We recommend testing a small, inconspicuous section of your hair before using Vamousse Shampoo if you have color-treated hair. One of the active ingredients is a sodium chloride solution that may decrease the vibrancy of some hair colors. Can I use this shampoo as my new daily shampoo for longer than 10-14 days? Yes! The ingredients in Vamousse Shampoo are safe, non-toxic, and pesticide-free. It is gentle for ongoing daily use. Does Vamousse Shampoo eliminate eggs like Vamousse Treatment does? Vamousse Shampoo is proven in laboratory studies to kill lice. Following the instructions, continued use for 10-14 days is required to kill any new lice that may have hatched from eggs that existed before you began the Shampoo regimen. How does Vamousse Shampoo work? Vamousse Shampoo uses the active ingredient Natrum Muriaticum to kill lice by dehydration. The unique formula uses an innovative technology to remove the outer protective layer of lice and their eggs, optimizing the activity of the active ingredient to dehydrate lice, ultimately resulting in death. Can I use Vamousse Defense shampoo on other parts of the body? Vamousse Lice Defense shampoo is intended for use only on the head, including the scalp and hair. Do not use the product on eyebrows, eyelashes or in the pubic area. See a doctor if lice are present in these areas. Full study data is available on file.